The production and processing of food and beverages is governed by a rigorous network of laws, regulations, codes of practice and guidance. The aim of these rules and guidelines are to minimise possible risks to the consumer from potentially harmful products that result from the presence of foreign bodies or bacteria. The use of pressure instrumentation is an essential part of safe food production. Pressure and level measurement in the food, dairy, beverage and processing industries is required in piping, filters and tanks. Pressure instruments must be accurate, immune to vibrations, able to withstand the temperatures and stresses generated by cleaning processes, and have specialised wetted parts. Applications include balance tanks, silos, storage tanks, mixing processes, flavour systems, pasteurisation, emulsifying, filling machines and homogenisation. The majority of electrical pressure transmitters use a flexible diaphragm as the pressure transmitting element. By using the appropriate process connection, it is possible to produce flush mounted pressure transmitters that have no cavities and are easy to clean. CIP (Clean In Place) cleaning is utilised to clean the interior surfaces of pipelines and tanks of liquid and semi-liquid food and beverage processing equipment. This type of cleaning is generally done with large tanks, kettles or piping systems where there are smooth surfaces. The ‘wetted part’ of a pressure transmitter is the diaphragm which is in contact with the medium being measured and must be able to withstand the forces and temperatures generated during CIP cleaning and sterilisation procedures. Regular cleaning and gap free design reduce risk of contamination, but the finish of the wetted parts must also have smooth contours and clean welding with no nooks and crannies that may cause the media to gather and rot. Usually components are made from stainless steel to prevent media from sticking. 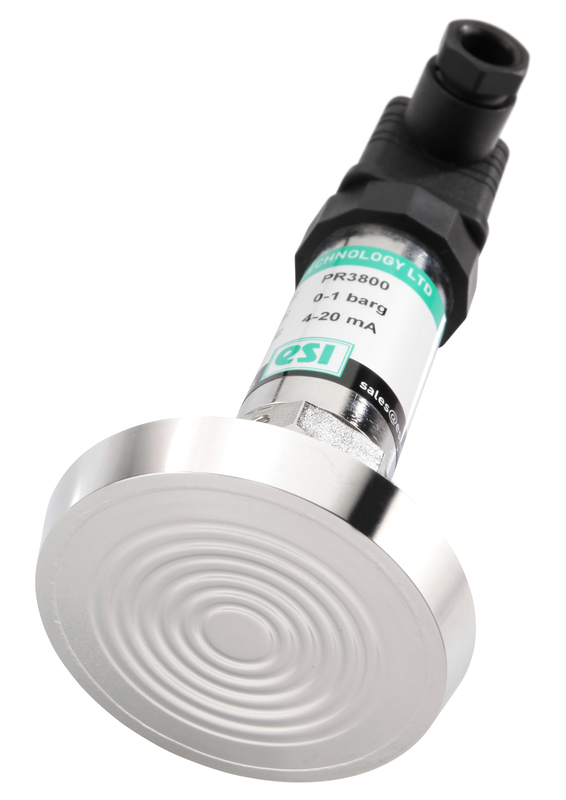 The PR3800 range from ESI Technology includes a range of flush diaphragm transmitters that have been designed to meet the requirements of the majority of industrial food and beverage applications. Robustly constructed from stainless steel, this range of pressure transmitters offer excellent stability and accuracy over a long service life. The flush membrane are suitable for CIP and seals are available in a variety of forms that can be installed directly to the process or remotely via stainless steel capillary. For very high temperature processes the PR3860 version of this product is suitable for use with media temperature up to 250ºC. A different method for continuous measurement of liquid level in the food and beverage industry is the hydrostatic method. Hydrostatic pressure is commonly described ‘The pressure equivalent to that exerted on a surface by a column of water of a given height due to the force of gravity’. A liquid column above the pressure sensor creates hydrostatic pressure, which is a direct indicator for the liquid level. The measurement depends on the density of the liquid, but this can be entered as a calibration parameter. The PR3400 range of hydrostatic pressure transmitters from ESI Technology Ltd have been designed for the measurement of depth and level of liquids for many applications. 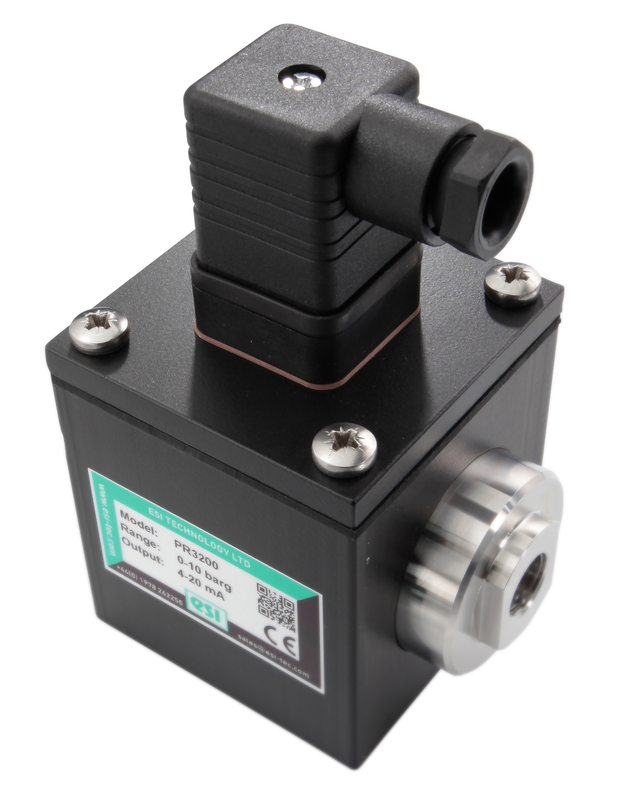 The measuring cell of the pressure sensor detects small changes in hydrostatic pressure, which increases or decreases according to the filling level. 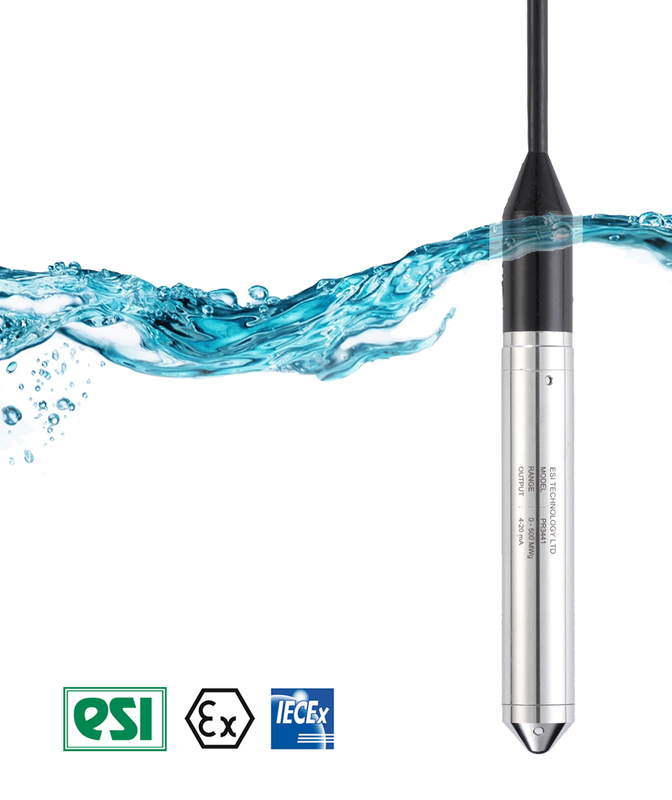 The ESI sensor is powered by a vented cable and is submerged into the liquid to be monitored. They are typically manufactured from 316l stainless steel, making them suitable for immersion in most media. The PR3420 version incorporates an additional platform that raises the transmitter above any layers of sludge that may be present in the media. In the case of open vessels, where atmospheric pressure is acting on the head of the liquid, a gauge pressure sensor can be used. For closed vessels two sensors are required. Measurements can be made with either two separate gauge pressure transmitters or a differential pressure transmitter. The food industry uses differential pressure transmitters for flow measurement in service systems. This is due to its robustness and simplicity. ESI Technology has a range of differential pressure transmitters in DP, bi-directional or gauge reference. Available for ultra-low pressure ranges up to 200bar, they offer high stability and performance with true wet/wet operation, and suitable for all liquids compatible with stainless steel and titanium. If flammable liquids and dust are present, the ESI range of flush diaphragm, hydrostatic and differential products are available with ATEX/IECEx approved options.